So, which books are they? Here are three classic books I’d recommend if you’re planning on traveling in and around Japan. The Inland Sea, by Donald Richie(Originally published in 1971, re-released in 2002 by Stonebridge Press). American Donald Richie, is a prominent Japanese film critic and a long-time book and film reviewer for The Japan Times. He has published over 40 books on Japan. During the 60’s, traveled by ferry to various islands in the Seto Inland Sea and wrote about his experiences. An eloquent writer, his book captures scenes of island life in the Seto Inland Sea in the 1960’s. Alan Booth, who passed away in 1992, walked the length of Japan from northern Hokkaido to Sata, the southernmost part of Kyushu in 1985. He wrote about the villages and the people he met from the perspective of a British foreigner in Japan. Booth wrote a sequel to this called Looking for the Lost: Journeys through a vanishing Japan (Kodansha Globe, 1997). American Alex Kerr bought an old traditional Japanese house in the countryside of Shikoku and through the process of fixing it up tells stories about the local Japanese people in the Shikoku area. Part memoir and part his own struggle to understand the country and culture, Kerr’s knowledge of Japan deepens along with his own interests in Japanese art, antiques and kabuki. In this book, which covers a 30-year period, he also talks about how Japan is slowly destroying itself environmentally. This theme he further expands upon in his latest book Dogs and Demons. Dogs and Demons has been widely read by lovers of Lost Japan, but many readers have complained about his negative attitude in this second book. Dogs and Demons is what I call Kerr’s “angry book” about Japan. He definitely has a few bones to pick. Perhaps that’s why he eventually moved to Thailand. Once you find how affordable a long-term rental guesthouse in Japan can be, you might find you want to extend your stay in Japan. International guesthouses, colloquially called gaijin houses(foreigner houses) can be very affordable if you’re staying in Japan a month or longer. For example, you can get a room for 48,000 yen (includes electricity and gas) with a shared bath, kitchen and living room. That’s what five nights in a Japanese-style minshuku or ryokan would cost you! The advantages of staying at a gaijin house are numerous. They are short term, and allow you to live in a furnished apartment-style setting without having to pay large sums for key money and deposits. Instead, you merely pay your rent up front via credit card and you can come and go as you please, or even leave for a few days and come back “home” at the end of the week. Your gaijin house can act as a home base from which you can leave some of your belongings so you can travel lightly on day trips outside of Tokyo, a weekend trip to Mt. Fuji or even a week-long trip to other parts of Japan on your JR Rail Pass. Gaijin houses can be found all over Japan, but most are concentrated in the Tokyo area. These guesthouses are set up for longer stays and thus offer internet access, a TV/recreation area and English speaking staff. They tend to attract students and other budget travelers seeking longer stays. It is no frills accommodation, but unlike youth hostels, gaijin houses are usually close to train lines and convenient to all parts of the city. 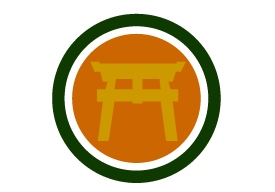 Gaijin houses are hubs for travelers to meet, share stories and get the lowdown on what to do and where to go. Gaijin houses have been around as long as gaijin have but were previously only accessible to travelers after they had arrived. In the past, many foreigners used gaijin houses as a temporary residence while they searched for a job. But recently, they have seen the potential in advertising gaijin houses online to get advance reservations. This movement has been headed up by Sakura House, who owns 190 properties in the Tokyo area which are rented out on a monthly basis. 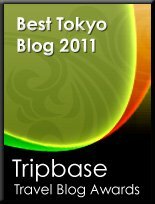 Gaijin House Japan lists properties all over Japan, including Okinawa, and has a comment system where you can read about other traveler’s experiences. The deals at gaijin houses are so good, even Japanese people are said to be taking up temporary residence in them! Gaijin House Japan lists gaijin houses all over Japan and offers more upscale offerings. See their English website. Sakura House has a website in English. If you’re visiting Japan, you’ll no doubt want to see a few shrines and temples. Shinto shrines and Buddhist temples are main draws for all travelers, domestic and foreign. Especially if you’re traveling in the Spring or Autumn, however, I recommend you get off the beaten track a bit and take the some of the more scenic routes to these temples and shrines. During these shoulder seasons when the weather isn’t so hot, you’ll find many more opportunities to enjoy the great outdoors, and one way is to combine shrine and temple viewing with hiking to your destination. In Japan, high places are considered sacred and are the abodes of the gods. Thus shrines and temples are often found on top of mountains. While most of these destinations provide a rope-way for easy access, you always have the option of walking up to the shrine or temple instead. These are the original routes used before the ropeways (or paved roads to the top) and are generally well-maintained. You’ll be able to take in the autumn foliage or the spring cherry blossoms, while listening to birds chirping and rivers flowing. You may also see some wild deer or monkeys. 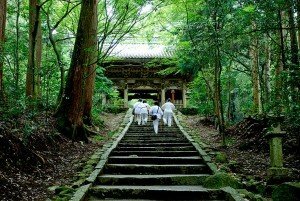 Mt Hiei offers the Enryakuji Temple complex at the top which is the headquarters of the Tendai Sect of Buddhism. This hike (800 meters) can be completed in an hour and a half. Don’t try this in wintertime, however, as it will be blanketed in snow! Mt. 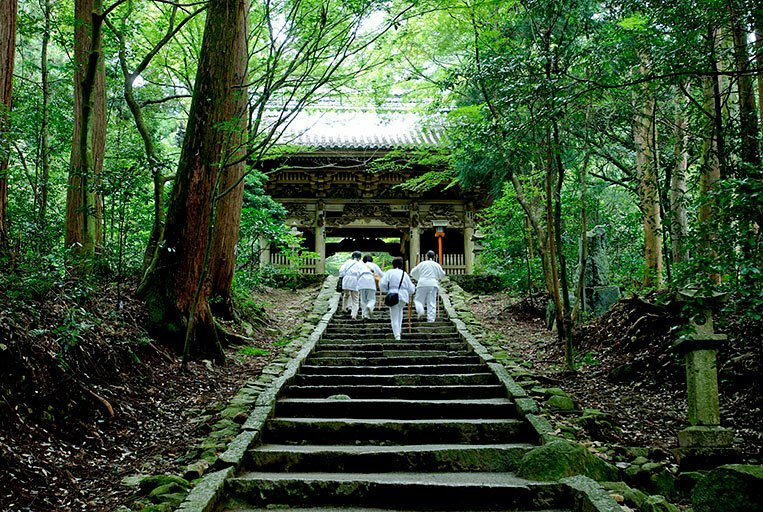 Hiei is famous for the “marathon monks” who wander the mountain. Mt. Misen (535 meters) is the sacred mountain of Miyajima Island, a world heritage site and home of Itsukushima Shrine and the Great torii gate in the sea (built in A.D. 593) The hike up takes a couple hours and is moderately difficult. The trail is immaculately groomed. You’ll definitely see deer on your hike! There is a small temple at the top and an eternal flame said to have been lit by the Buddhist monk Kukai after 100 days of meditation and has been burning for over 1,200 years. 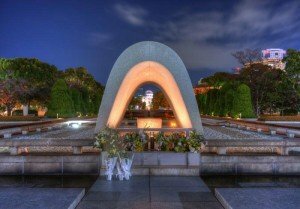 This flame was used to light the eternal flame in the Hiroshima Peace Park. This shrine is famous for its 1,368 steps to the top! The mountain is officially known as Mt. Zozu, and the shrine known as Kotohira, but most people just call is Kompirasan. Kompirasan has been both a Buddhist temple and a Shinto shrine over the years and fisherman and those who make their living from the sea come here each year to pray to the deity of the sea who lives at the top. The main shrine is reached after 785 steps (about 30 minutes, 521 meters), and the remaining 583 steps (which seems to be optional) takes another 20 minutes. Learn more about the Marathon Monks of Mt. Hiei in this incredible account by Holly A. Schmid. Fall is a great time for kayaking, canyoning and rafting. These sports also offer a great way to see some of Japan’s amazing scenery. Imagine kayaking with views of Mt. Fuji, paddling down Shikoku’s scenic Yoshino River or gliding among the calm waters of the Seto Inland Sea. From rivers to seas, these sports will be sure to give you a Japanese thrill. Here is a quick list of some of the best places to hit the rivers and seas on Japan’s four main islands from North to South. Scott Adventure Sports (SAS) offers white water rafting, ducky (inflatable boats) and canyoning from April thru October. Canyoning is a combination of abseiling waterfalls and cliffs and sliding down natural chutes of water into pools. SAS is located in the mountain range of the Niseko Ski Areas. Niseko is famous for its powder snow (15 meters per year!) and when this snow starts melting in April, the rivers swell and make for some great rafting. Bashukway Travel offers specialized adventure tours for women, small groups and even individuals. Try their one-day tour “coasteering” the Izu peninsula. Coasteering is a combination of walking, scrambling, climbing, swimming and jumping into pools of water—all activities done along the sea coast. Wetsuits, helmets and gloves provided. 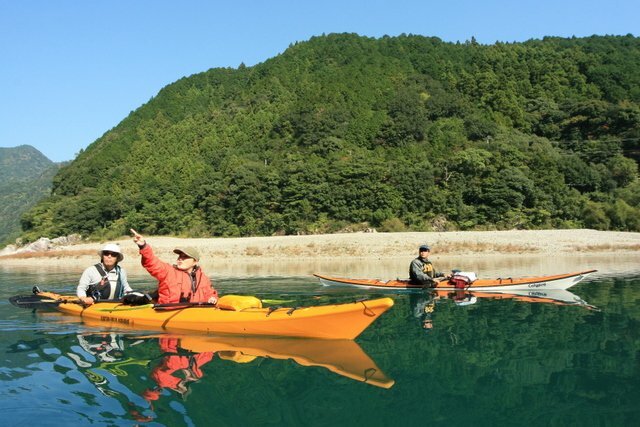 Japan’s Inland Sea offers great kayaking and canoeing for beginners because of its calm waters. There are also more challenging guided kayaking tours that go through the Inland Sea for several days at a time. Practically every island (and there are over 250 inhabited islands in the Inland Sea) has kayak rentals. Look for marine stations, called “umi no eki” which often have kayak rentals. Maejima, Miyajima, Oshima Shimanami Kaido Islands, Shimokamagari Island, Shiraishijima, and Shodoshima are just a few islands offering kayaking. Yakushima Nature Activity Center on the island of Yakushima, off Kagoshima offers river and sea kayaking. Yakushima is a UNESCO site and offers many other things to do, including visiting the Cedars which are thousands of years old. Don’t miss kayaking through this nature wonderland! Japan’s Inland Sea, called “Seto Naikai” in Japanese, is one of Japan’s best kept secrets. While most people only know the bigger islands (called “shima”) such as Awajishima and Shodoshima with extensive ferry services to bring people, cars and trucks from the mainland, the smaller islands are accessible only by the occasional ferry or private boat. As the smaller islands become more popular even among Japanese travelers, the options for getting around to them are increasing, but tourism along the Inland Sea is still in its infancy. Unfortunately, the ferry services do not cover inter-island travel. You can take a ferry from the mainland to most any island, but you’ll have to go back to the mainland each time and catch another ferry to take you further east or further west. This is expensive and time-consuming. Although hiring a private boat to get around the Inland Sea is not cheap either (20,000 to 50,000 yen per day per person depending on if you want meals and accommodation included) it gives you a chance to see things that other tourists would never get to see. 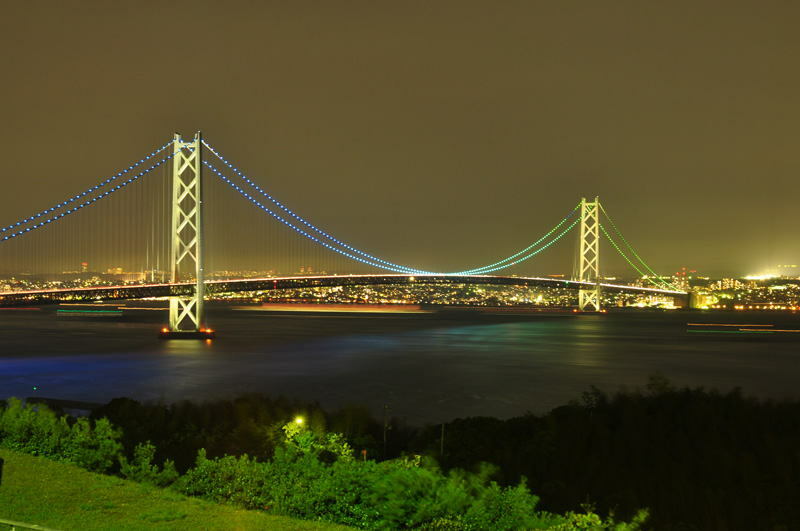 Awajishima is the biggest island in the Seto Naikai. 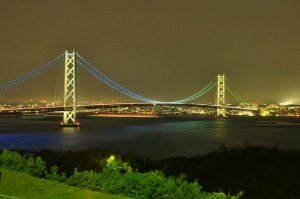 It has only been accessible to the masses since they built the Akashi-Kaikyo bridge in 1990, the longest suspension bridge in the world. The island sits right in the middle of Honshu and Shikoku. You can take a train, bus or ferry there from Kobe. Shodoshima is the second largest island in the Seto Naikai and resides in Kagawa Prefecture. Shodoshima is famous for its olives and you will find olive trees everywhere there. There is an olive picking season and the island thrives on sales of products made from olives and olive oil. There is a high-speed ferry from Osaka to Shodoshima for approximately 5,800 yen. Fast becoming a very popular island among foreigners, Naoshima is also called Benesse Art Site. The island features modern art in many forms from a traditional art museum, to gigantic sculptures situated around the island and the “Art House Project” that puts art exhibits in old, once-abandoned Japanese houses. Anyone who loves art should spend at least a day here. Access by ferry from Okayama. This small island of 700 people has been on the foreign tourist map for 20 years now because of promotion by the Okayama Prefectural government. It is still largely undiscovered, however, as tourism has been limited to those who live in Japan and are “in the know.” Years of prefectural backing have resulted in a user-friendly, English-speaking infrastructure. Once limited by the number of tourists the prefecture would accept, the island is now opening up and is able to accept more visitors. Shiraishijima is best known for its beach and traditional Japanese island culture. Accessible by ferry from Kasaoka. The third Monday of September is Respect for the Aged Day, a national holiday in Japan. The Japanese call national holidays “red days” because they appear in red print on the calendar. As this will make September 12–14 a long weekend, be prepared for heavier than usual traffic and crowded trains if you are traveling. Respect for the Aged Day, called keiro no hi, is not quite like “Grandparent’s Day” in the U.S. It is far more serious. Neighborhoods will have volunteers distribute free “obento” boxed lunches to elderly people in the neighborhood and smaller villages will hold keirokai shows where the younger people and school children prepare dances and songs for a special keirokai ceremony. The elderly attendees are also treated to lunch, tea, and sweets after the performance. As Japan’s nation grays and people get older and older, some of these traditions may change, however. On the small island of 700 people where I live, the keirokai ceremony used to be held for those 60 years old and over. But with so many people over the age of 60 now, the qualifying age to attend the keirokai has steadily increased, and is now 65. As Japan’s society ages and nursing homes become more popular, being old may not be so special anymore—but rather the norm. Respect for the Aged Day is also a way to honor longevity, and Japanese people have always been some of the longest living in the world. But this is also changing as more and more Japanese people add meat and other western foods to their diets. In addition, city living is seen to cut lifespan due to pollution and stress. If you’re young and hip, or just want to act like you are, then Tokyo’s Akihabara district is the place to be. And luckily now, as it is becoming somewhat of a tourist-attraction (I say somewhat because if you catch it now, you can still see it before the tourist hordes discover it) you can even get a tour of Akihabara in English. But first, what exactly is Akihabara? This is the district in Tokyo that is famous for its maid cafes, anime and pop culture stores and electronics outlets. This is where the geeks, or otaku in Japanese, hang out. And in today’s Japan, being a geek is super cool! If you find Aki-ha-ba-ra a little too long to remember, just say “akiba” and you’ll be with the in Japanese crowd who have nicknamed it so. Akihabara is a vibrant and exciting shopping district with lots of people milling about all day long and into the evening. Dress up as your favorite anime character and join in the fun! Or shop till you drop finding the latest in Japanese anime software, CDs and DVD’s at domestic prices in the numerous Duty Free shops. Previously known as “electric town,” when Akihabara was more famous for its electronics outlets than anime, don’t miss the chance to pick up a new camera or other electronics (dictionaries, iPhones, etc) while you’re in Akihabara. Akihabara can be a bit overwhelming if you’re not used to Japanese cities with floors and floors of shops stacked on top of each other inside high rise buildings. As a result, there are a couple of places to get a tour of the area in English. These people will help guide you through the shops and buildings so you can get a handle on where everything is. A good place to start is the Tokyo Anime Center, which offers maps of the area, guide services and other information in English. Schools in Japan break for summer holidays at the end of July. Kids go back to school after summer vacation at the end of August. As a result, Japanese children only have four weeks of summer holidays, as opposed to the US where they have 12 weeks. Universities also follow this schedule, but with six weeks off in the summer. In addition, university students have another four to six-week holiday in the springtime. These two long holidays together give Japanese college students the same amount of holidays as American college students. Much of Japan’s summer activities are based around the four-week holiday, from the end of July to the end of August, a short window when families can go places together because the kids are out of school. These four weeks are the “high season” for places such as beaches, amusement parks and other family-oriented tourist attractions. Plan your trip to Japan wisely. The high season is not a good time to visit crowded amusement parks! On the other hand, the high season may be the only time you can visit a public beach and go swimming, as many of the beaches prohibit swimming outside of the designated swimming season. Accommodation, camping and outdoor activities will also be very hard to schedule during the short summer season. Early booking is necessary. When visiting tourist attractions during the high season, try to go on a weekday when it is much less crowded. If you must go somewhere on a weekend, try to go on a Saturday. Many Japanese people get only one day off a week, leaving Sunday the and only day for family time. I have not noticed great savings in Japan for traveling during the low season. Where I live on Shiraishi Island, for example (a summer destination with a beach, camping and water sports), the local accommodations do not raise their prices in summer nor drop them in the off-season. So while traveling in the low season may allow you to visit places without the crowds, don’t expect it to be any cheaper. In addition, many places are likely to be closed completely during the low season, as Japan still adheres to a rigid seasonal schedule for certain activities.